This book really exceeded all my expectations. What I had heard about this book prior to digging in was that Ruff had taken some of Lovecraft's themes and spun them from a black perspective. This is so much more than that though. 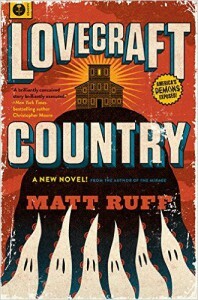 Ruff doesn't just plumb Lovecraft's oeuvre, but that of classic sci-fi and horror as a whole. And even better? It doesn't just place black characters into these stories, it focuses on the black experience. The real monster in this book, again and again, isn't whatever is creeping in the darkness: it is racism. And the book is not shy about it at all. It wasn't just different getting to see this perspective, it was actually refreshing. The characters were resourceful, clever, and always thinking ahead...because they had to in order to survive in the world. It made them amazing horror protagonists - they never passed around the stupid ball in order to serve the plot. It reminded me of that old Eddie Murphy bit about black folks walking into a haunted house, being told by a specter to get out, and them just walking right out the door. Here we have an entire cast of folks thinking on their feet, communicating with each other, and out maneuvering whatever gets thrown at them. I liked these people and it was a pleasure cheering for them. The one thing about this book that was a hurdle for me was the format, which took some adjustment. While there is one overarching plot, and things do tie together in the end, this book is structured as a collection of interconnected short stories. Each story focuses on a different character, and tells a different stand-alone story within the greater whole. As someone who rarely enjoys short stories this put me off somewhat, but the line that ran through all of them kept me connected to the book and made starting over in each section less of a chore. There were certainly parts I liked more than others (I particularly seemed to enjoy the stories focused on the female characters, which was a bit of a surprise), but I never felt particularly marooned like I have in some other collections. All in all this book was something special. If you're familiar with classic horror and sci-fi tropes, like haunted houses, animated dolls, or Jekyll & Hyde to name a few, this book should at the very least amuse. And if you also happen to be looking for more inclusive literature, or stories from black perspectives, this will likely strike a chord. I'm really glad I picked it up, and look forward to seeing how it adapts to the small screen in the future.